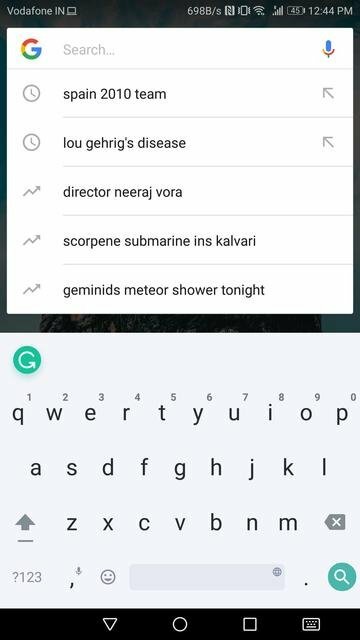 Most keyboard apps on Android are fairly satisfactory when it comes to predicting words and showing correct spellings. In retrospect, they’re not as satisfactory if you have Auto-correct turned on. 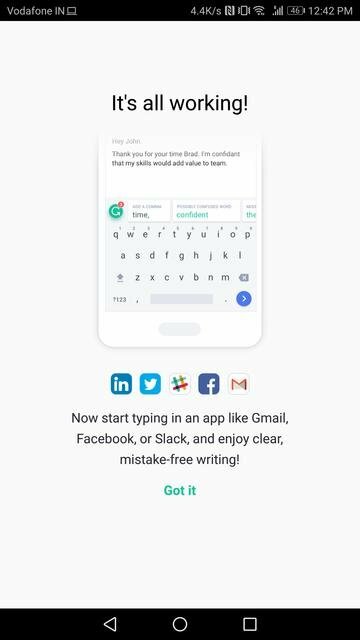 Grammarly has taken things a step further by integrating its grammar and writer’s voice correction technologies into a new keyboard. 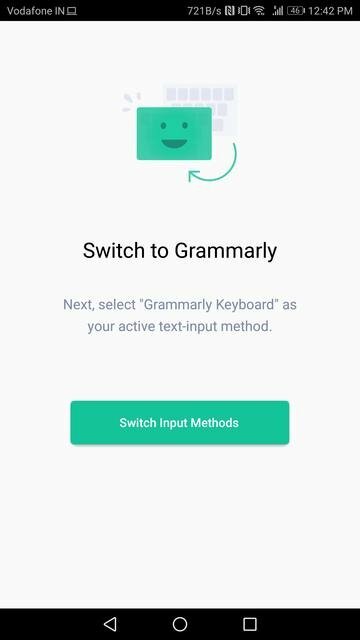 If you’re not aware, Grammarly is an online text and grammar correction tool that makes life for people like me a bit easier. It can be a bit annoying and set in its ways at times but that’s okay. It checks your typing as you go and checks for typos and grammatical mistakes and makes you feel miserable about your English like your third grade English teacher. 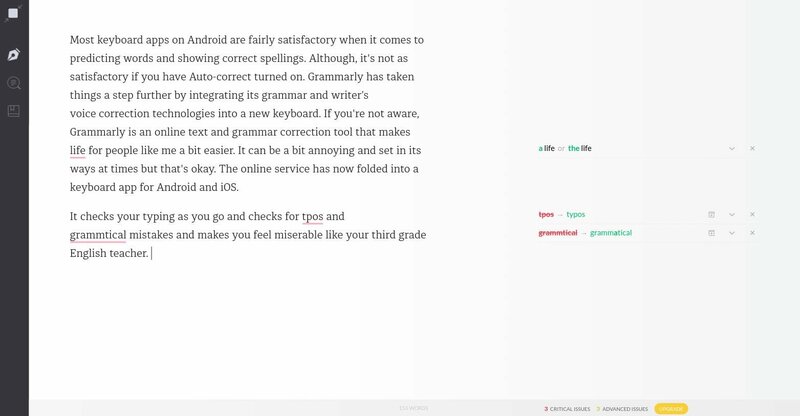 Grammarly has existed as a browser plugin for most popular web browsers and also as an online platform where you can type your article or whatever if you don’t use the browser plugins. 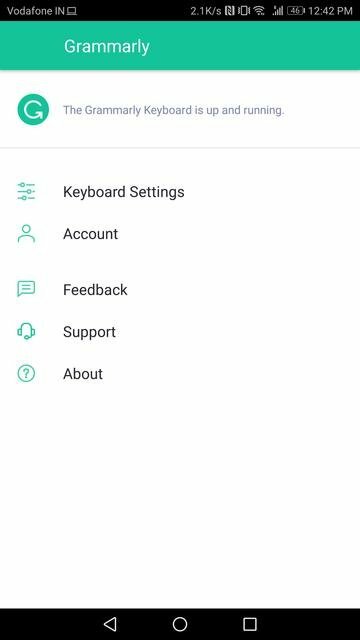 The online service has now been made available as a keyboard app for Android and iOS. Given that most of the typing is happening on mobile phones these days it was only a logical move by the company. But typing on your phone is not exactly of a professional level. People are more prone to typing errors and it’s exactly why most of the typing is for texting, even for professionals. It’s even worse if you’re a grammar nazi and are quick to point out typos and errors in everyone else’s typing. You have to be on your toes when typing to make sure you don’t make mistakes. I know because … well, you can guess. There are a few things you should know before you go ahead and install it though. First, let’s talk about what it does have. 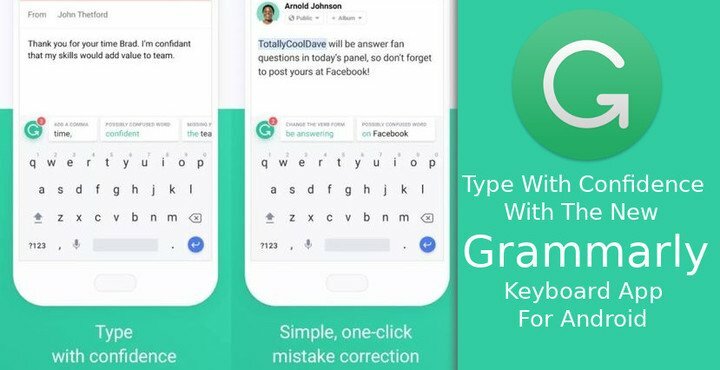 The Grammarly Keyboard is relatively straightforward and solely dedicated to improving your grammar, and spelling. Its aim is not to improve your typing experience. 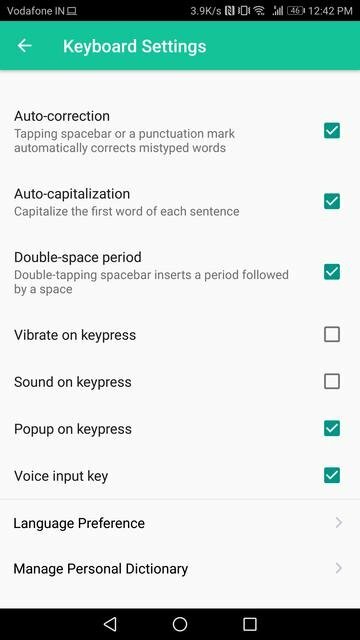 So it does offer some typing customization such as the ability to turn on or off double space for a period, auto-capitalization and auto-correction. 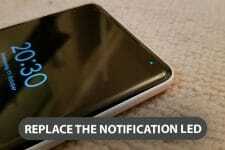 You can also turn on/off vibration, sound, popup and the voice input key. Language Preference lets you select between British and American English. That said, even though Grammarly does help often, this keyboard app can be rather disappointing if you’re expecting… anything, really. 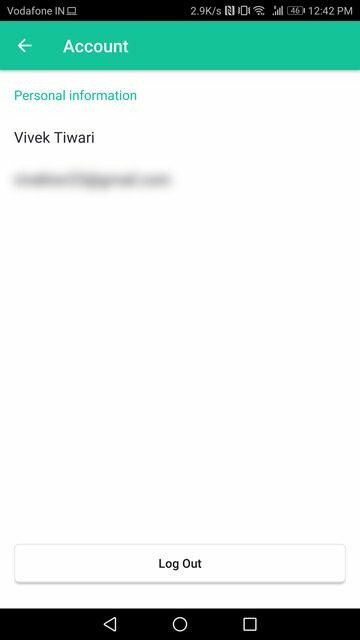 To call it a barebones keyboard app with the power of Grammarly would be over-selling it. It does not even have some of the basic keyboard options such as long-press for symbols. So if you’re someone who has spent the last few years swiping around on your keyboard app to type, forget it. It is supposed to arrive in future updates but it’s not here right now. The things you see in the screenshot above is absolutely all there is. What’s funny is the app doesn’t even recognize its own name. This feels like a really early testing version of an app that’s rather incomplete. But if you don’t mind not being able to long-press for symbols and don’t care about swiping to type Grammarly can be really helpful. You will need to be connected to the Internet at all times though. This is because Grammarly is an online service. If you’re offline, you will still get the usual text correction as you do on normal keyboards but you won’t get the advanced grammar features won’t. You don’t have to worry about security though because all your typing data is encrypted and no one else can read it. At least that is what the company claims. 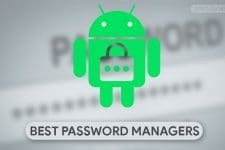 It also does not record any sensitive information such as passwords or credit card information. 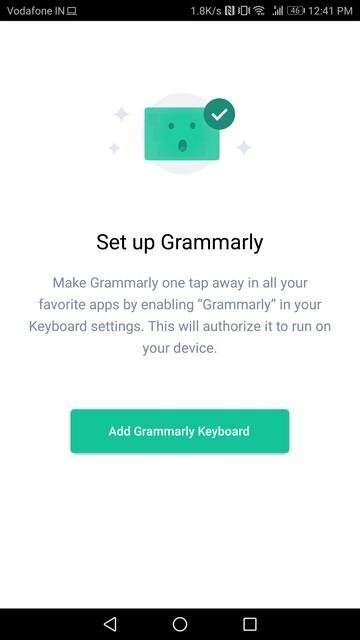 Enabling or activating Grammarly isn’t very different from any other keyboard app if you have installed one before. Launch the Grammarly app and sign up with your Google or Facebook ID or your email address. If you’ve used Grammarly before on your PC you can log in with your existing account. You can also tap the small Not now option in the bottom-right corner but that’ll reduce the already less number of available features. Without an account, you don’t get a personal dictionary. 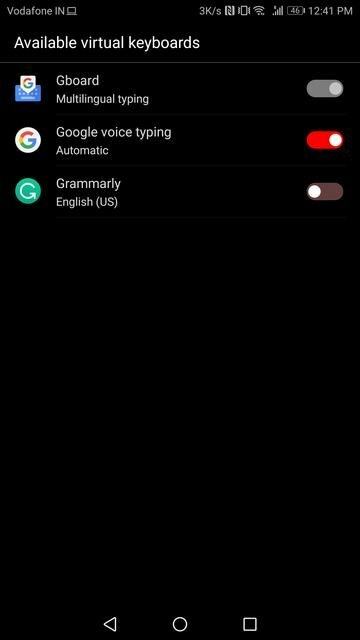 Regardless of your choice, tap on the Add Grammarly Keyboard button on the next page and you can enable it in your device’s Settings. Tap on the back button after toggling on the keyboard and tap on the Switch Input Methods button to make it your default keyboard app. When you tap Got it you’ll be taken to the main app page where you can configure it. There’s not much to configure really and whatever there is, or is not, we’ve already talked about.